The aim of Maurice Fombeure (1906–1981) was to ‘refresh’ poetry and give it a ‘new virginity’. He wanted to ‘wash it, brush it up, take it for a walk in the grass, in the wind and the woods. Let’s listen to our hearts—the head has played its part and failed—we now need a little freshness on earth, poetry made of drops of water.’ In order to achieve this Fombeure invested his work with the wit and energy of popular music and old folksongs. In his nautically titled Chansons de la grande hune (‘Songs of the maintop’, 1942) Poulenc found poems ideal for his purposes. The poems are divided into two sections: the first, Chansons de la grande mer, is concerned with sailors and life on the ocean wave; the second is Chansons de la petite terre, eleven poems in the style of country folksongs on dry land, six of which Poulenc set to music. In JdmM he writes: ‘The texts by Fombeure evoke the Morvan where I have spent such wonderful summers! It is through nostalgia for the surroundings of Autun that I have composed this collection.’ This music comes across as a defiant celebration of the French way of life impervious to the German occupation. Poulenc conceived Chansons villageoises as an orchestral cycle with quite a large percussion section, and it was first sung by Roger Bourdin in 1943 rather than by Pierre Bernac. The composer had envisaged a ‘heavy Verdi baritone (Iago)’ but later admitted that this momentary ‘infidelity’ to his favourite singer had been a mistake. Bernac recorded the piano-accompanied version of the cycle with the composer, perhaps because the vocal requirements of the set—subtlety of colour and diction, the ability to negotiate piano singing in the heights of the passaggio—are hardly associated with a heavy operatic voice. These mélodies, clever stylizations of chansons, are among Poulenc’s most diverting pieces of musical conjuring. Henri Hell wrote that in these songs ‘the shrewdness of the peasant emerges’, the same shrewdness in relation to the German enemy during the war as to his survival in a feudal society since time immemorial. In both cases peasants pay minimum lip-service to those who wield power, and then disregard and covertly undermine them. In this poem the village’s bigwig, lord of the manor, has died (perhaps as a result of sexual excess); it doesn’t seem as if he was liked, much less loved. His death and ceremonial funeral (Saturday) will be followed by joyous dancing at the village fête (Sunday). Life goes on. The imagery here is almost surreal, and certainly Fombeure flirted with the surrealists, but the incongruous juxtapositions here are the result of the ‘little people’ determined to live their lives to the full. The music is an irrepressible onslaught of quixotic individualism. Vive la France! by the beetle will go. have stuck a flower in their hats. The young working-class men, ‘strapping fellows’ with flowers stuck in their hats, have come to dance at the village fair having scrupulously prepared themselves for their weekly outing. In JdmM Poulenc (who clearly finds them both attractive and touching) imagines them ‘rasés à la cuiller’—shaved to the underskin, and doused with ‘the common odour of Sunday aftershave’ as they dance at Julien the fiddler’s. The dance takes place in a marquee that mirrors bourgeois opulence: ‘In the Morvan it is possible to buy portable ballrooms with polished floors, crochet curtains, plush seats, copper candelabras.’ Poulenc provides music that Bernac describes as having a certain ‘truculence’ and ‘a certain peasant coarseness (quite different from Parisian slang)’. How different this is musically from the Butterworth-Housman Gloucestershire gathering, The lads in their hundreds, but something of a similar occasion is described. The French knees-up sounds far more fun, although there is a sexual undertone in both poems. Poulenc relishes occasions such as these where drink unbuttons inhibitions in unexpected ways. The music manages to sound both deft and clumsy—meticulous, and at the same time casual. Once again, vive la France! Ont mis la fleur au chapeau. lasts so short a time. At the heart of this cycle is a real jewel, one of Poulenc’s most beautiful creations. 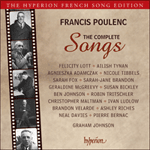 ‘The singing of this song’, writes Poulenc in JdmM, ‘must be as clean and sad as an April day.’ The accompaniment is remarkably spare (particularly at the beginning) and the vocal line wafts and weaves with the greatest sweetness, spring sunshine streaked with the melancholy of Poulenc’s trademark harmonies. Here is a French equivalent of Shakespeare’s ‘Youth’s a stuff will not endure’; the composer responds to the ache in the imagery and seems to hold the beauty of spring within his own tender embrace. ‘Then come kiss me, sweet-and-twenty …’ At the age of forty-three he already feels himself past his prime. The poem’s title is Complainte de Jean Martin. Fombeure was not a political activist, but there is nothing as angry as this in all the settings of Éluard (who was a Communist), and it is all the more effective for its sudden appearance in the middle of this rural idyll. The juxtaposition of light and shade is a Poulenc speciality, and sudden violence in the countryside immeasurably strengthens a cycle that might otherwise have appeared lightweight. Poulenc admitted to the influence of Musorgsky, especially his Songs and dances of death, and there is indeed something very Russian about the contrast of the beggar’s plight with the comforts of the rich bourgeoisie. Fombeure’s fury is directed at the fat cats of monastery and manor who were more than happy to benefit from Jean Martin’s bravery at the time of the 1914 war, but decline to help an aged veteran down on his luck. The introduction has echoes of the Chanson à boire from the Chansons gaillardes as well as the lumbering elephants in Babar—music for the power (and menace) of sleeping giants. Here, Poulenc imagines the giant waking up: the gathering of momentum is splendidly managed, as if the tumbrils of the revolution were rolling to the scaffold. This is Poulenc’s mélodie fantastique, unlike any other he wrote, music ominous and angry that covertly imagines the underdog turning its fury against the alien aggressor … Vive la Résistance! As if embarrassed by the intensity and seriousness of the preceding song, Poulenc now goes to another, dizzy extreme of frivolity. The poem closes Fombeure’s Chansons de la grande hune. Although breathless vocal scherzi had been a Poulenc speciality ever since the Trois poèmes de Louise Lalanne, the composer here excels himself in that genre where semiquavers, an octave apart between the hands, rove the keyboard with windswept insouciance. The composer provides fast and naughty music for a girl who is also both those things, albeit in an adorably rural way, and without a touch of metropolitan sophistication. Sous la lune de printemps. along by the astonished thorn bushes. Fombeure’s poetry had long been associated with the military as is shown by his collection Soldat (1935), and particularly the humorous side of being a soldier. This poem however is not at all funny. Its appearance in a book of poems hot off the press in 1942, when Poulenc composed his settings, might just as well refer to the Second World War as the First. Shortly before Poulenc wrote these songs, French soldiers had been demobbed in the wake of great losses incurred during a futile struggle against the Germans. The humiliation of the situation, as well as patriotic anger, were felt as keenly by simple working folk as by the intellectuals (such as Aragon who wrote the poem C). In tramping back to his village the sergeant remembers his dead chums and while retaining his disciplined bearing (the music is an implacable march) he sheds a tear for them. We also learn that he himself is far from well: he has been spared death but he is suffering, probably without realizing it, from what is now termed trauma and shellshock. A cycle that has begun in such a merry way, the French countryside impermeable to change, has gradually found its way back to the present, 1942, and the harsh realities of war. 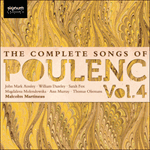 It is this pertinent mixture of moods and styles that makes this cycle one of Poulenc’s finest. Le long des buissons étonnés.